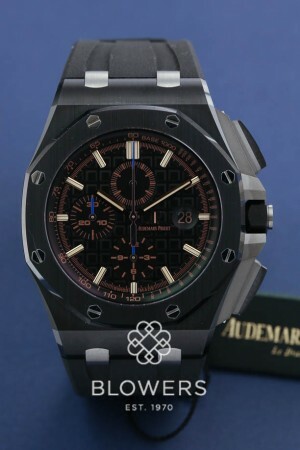 Audemars Piguet Royal Oak Offshore Chronograph 26405CE.OO.A002CA.02. 44mm black ceramic case. Automatic chronograph caliber AP 3126/3840 movement. 50 hour power reserve, 365 parts, 59 jewels. Black dial with “Méga Tapisserie” pattern, black counters, pink gold applied hour-markers and Royal Oak hands with luminescent coating, black inner bezel. Titanium glare proofed sapphire crystal and caseback, black screw-locked crown and push-pieces. Black rubber strap with titanium steel pin AP buckle. Pre-owned Unused. Box and papers dated January 2019. SKU: 30-88-187. Categories: Audemars Piguet, Royal Oak Offshore.